Three bite marks left in the Martian ground by the scoop on the robotic arm of NASA's Mars rover Curiosity are visible in this image taken by the rover's right Navigation Camera during the mission's 69th Martian day, or sol (Oct. 15, 2012). The third scoopful, collected on that sol, left the bite or pit farthest to the right. Each of the three bites is about 2 inches (5 centimeters) wide. NASA's Mars rover Curiosity has swallowed its first tiny bite of Martian soil, after standing down for a spell while scientists checked out some strange bright bits in the dirt. The $2.5 billion Curiosity rover ingested the minuscule sample — which contains about as much material as a baby aspirin — on Wednesday (Oct. 17). The soil has been successfully delivered to the rover's Chemistry and Mineralogy instrument, or CheMin, mission scientists announced today (Oct. 18). "We are crossing a significant threshold for this mission by using CheMin on its first sample," Curiosity lead scientist John Grotzinger, of the California Institute of Technology in Pasadena, said in a statement. This image shows part of the small pit or bite created when NASA's Mars rover Curiosity collected its second scoop of Martian soil at a sandy patch called "Rocknest." This image was taken by the Mars Hand Lens Imager (MAHLI) camera on Curiosity's arm during the 69th Martian day, or sol, of the mission (Oct. 15, 2012). The sample that found its way into CheMin came from the third scoop of soil Curiosity dug up at a site dubbed "Rocknest." The first scoop was discarded after being used to scrub out the rover's sampling system, to help ensure that no Earth-originating residues remained. Work at Rocknest slowed after Curiosity dug its second scoop on Oct. 12, when researchers noticed oddly bright flecks at the bottom of the hole. The team dumped the scoop out, worried that it might contain debris that had flaked off Curiosity. They already knew that some tiny rover pieces are littering the Martian ground, after spotting a bright shred of what appears to be plastic on Oct. 7. Team members have since identified five or six other such bits, which may have fallen off Curiosity's sky-crane descent stage during landing on Aug. 5. "We went super-paranoid," Grotzinger told reporters today. The team determined that "if this stuff is man-made, we better make sure that we're not taking any of it in." So Curiosity moved to a slightly different location, and then took lots of pictures to make sure that the surface was pristine before making scoop number three. If any bright flecks are indeed present in the sample, they're naturally occurring, the mission team reasons, since any rover pieces would be restricted to the surface. All that being said, Curiosity scientists now believe the bright soil flecks are indeed indigenous to Mars. They could be minerals that are part of the soil-forming process, Grotzinger said, or reflective surfaces created by the cleaving of ordinary dirt. The team aims to fire its mineral-identifying laser, which is part of Curiosity's ChemCam instrument, at some of the pieces in the next few days to get a better idea of what they actually are. Curiosity carries 10 instruments to help it determine whether its Gale Crater landing site has ever been capable of supporting microbial life. But CheMin and another instrument on the 1-ton rover's body, known as Sample Analysis at Mars (SAM), are the rover's core scientific gear. SAM is a chemistry laboratory that can identify organic compounds — the carbon-containing building blocks of life as we know it. The instrument has been sniffing the Martian air already, but it has yet to analyze its first soil sample. That should change in a week or so, Grotzinger said, after further cleaning of the rover's sampling system. 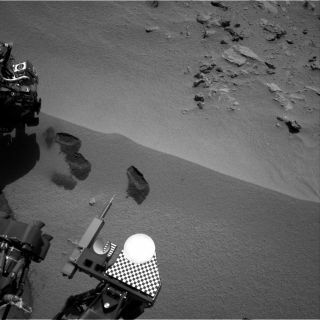 Curiosity continues to be in good health, researchers said. After the six-wheeled robot finishes testing out its scooping and sampling systems at Rocknest, mission scientists will begin searching for a spot to break out the rover's rock-boring drill. The first drill activity will be a complicated affair that could take month or so all up, Grotzinger said. Curiosity is currently checking out deposits near a site called "Glenelg," where three interesting types of Martian terrain come together. But its ultimate destination is the base of Mount Sharp, the 3.4-mile-high (5.5 kilometers) mountain rising from Gale Crater's center. Mount Sharp's foothills show signs of long-ago exposure to liquid water. Curiosity could be ready to start rolling toward the mountain's interesting deposits — which lie about 6 miles (10 km) away — in a couple of months. "I would hope we'd be on our way by the end of the year," Grotzinger said.